Mushroom cloud rises from the South Pacific atoll of Elugilab during the 1952 "IVY MIKE" test. A mushroom cloud is the ominous formation often seen in the sky following a nuclear explosion or volcanic eruption. This type of cloud derives its name from its resemblance to an actual mushroom, complete with a bulbous top and a centralized stem. 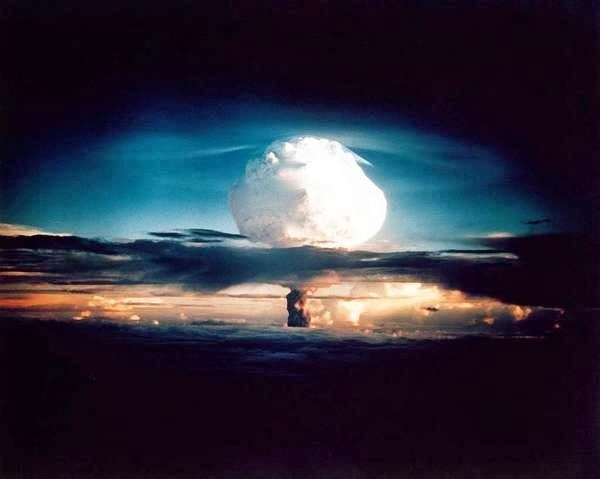 Following the dropping of atomic bombs on the Japanese cities of Nagasaki and Hiroshima, the image of a mushroomcloud has become a grim icon for the destructive power of nuclear weapons. When an atomic bomb is dropped over its target, it does not hit the ground and explode. This would force much of the bomb's destructive force into the earth, not through the buildings above it. Instead, an atomic bomb is detonated several thousand feet in the air. The force of this blast instantly pulverizes anything in the blast area into dust and debris. Meanwhile, a ball of super hot gases forms instantly in the sky, which destabilizes the surrounding air and creates powerful currents. Why do nuclear bombs make mushroom clouds? The phenomenon all comes down to a little something called the Rayleigh-Taylor instability, and by extension, convection. I'll begin with the somewhat longer, but less geeky explanation before descending once again into extreme nerdery. The perception that the mushroom cap is curling down and around the stipe is primarily a result of the differences in temperature at the centre of the cap and its outside. The centre is hotter and therefore will rise faster, leaving the slower outer edges to be caught up in the stipe convection's awesome attributes.